This rifle was designed by a Canadian, Sir Charles Ross, towards the end of the 19th Century, first issues being made in 1905 to the Royal Canadian Mounted Police. The rifle was unusual in being of the straight-pull' type in which the bolt handle was drawn straight back, the breech being unlocked by the rotation of the locking lugs by means of cams. It had a magazine capacity of five rounds which in the early models had to be loaded singly, and it proved to be an excellent target rifle. There were, however, fundamental defects in its design which rendered it unsuitable as a service rifle and although a whole series of modifications were hastily made there was no significant improvement. The British School of Musketry reported unfavourably on it but in spite of this the Canadian Army went to war with it in 1914. their particular weapon being the Mark III which could be loaded by charger. Its main fault, that the bolt stop bore on one of the locking lugs causing it to burr, led to disastrous consequences, particularly in the mud of the trenches when Canadian soldiers were seen angrily kicking their rifle bolts to open them during German attacks. It was quickly replaced by the Lee-Enfield and little more was heard of it although a few were resurrected for the British Home Guard in the early years of World War II. In 1908 a Major M. G. Farquhar produced an automatic rifle which he had invented in conjunction with Mr. Hill. There was at that time some military interest in automatic rifles and the weapon was tested by the Automatic Rifle Committee which the British Army had set up for the express purpose of investigating weapons of this type. The Farquhar-Hill, although well made by the Beardmore Company, turned out to be an extremely complex weapon. It utilized the system of long recoil, but faulty design kept the barrel and breech locked together long after the bullet had left the muzzle: this and other complications led to problems of feed and the gun was rejected. Nothing more was heard of it until 1917 when a second version appeared; this was described, very accurately, as a light machine gun with some potential as an aircraft gun, but was in fact an improved version of the earlier gun: its main difference was in its unusual magazine which was in the shape of a truncated cone, motive power being provided by a clockwork spring. This version was also tested and rejected, being very liable to fouling and prone to a variety of complex stoppages. It was in any case somewhat late, since it appeared at a time when the Lewis gun was giving good service. The inventors were extremely persistent and as late as 1924 they submitted the weapon illustrated. This had a similar but much smaller magazine with a capacity of ten rounds (as compared with up to sixty-five in the earlier versions) but again it was unsatisfactory (still mainly because of its defective magazine) and was not therefore adopted. Thus it passed into history. Pedersen was unusual in that its breech was not positively locked at the moment of discharge. Instead it made use of a hesitation-type lock, similar in principle to that of the Luger pistol but so designed that its various bearing surfaces held it closed until the chamber pressure had dropped to a safe level. The rifle was tested by the British Government in 1932 and it was described as being the most promising arm of its type that the Small Arms Committee had then seen. In spite of a magazine capacity of only ten rounds it was reported to have fired 140 rounds in three minutes, a remarkable performance. Unfortunately however the breech, although safe, began to open when the chamber pressure was still quite high. This led to difficulties of extraction and in order to overcome this Pedersen had his cartridges dry waxed. This, reasonably enough, was not acceptable in a military cartridge which would have to be stored world-wide in a variety of conditions and climates, so the Pedersen was not finally accepted after all. This was a pity because it was a neat, handy weapon which shot well and its cartridge was of exceptionally good performance. It is possible that it might have performed well with a fluted breech, which was later designed for this type of contingency, but by that time better self-loading rifles were available. It could fairly be argued that this weapon should be listed under the United States. As however the model illustrated was made in England for test by the British Government for possible use by the British Army it seems reasonable to include it under British weapons. A modified FN. 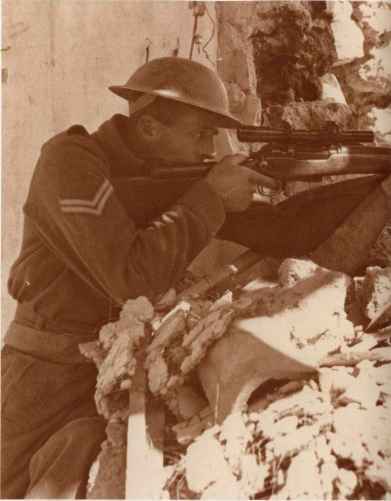 the L1 was the standard rifle of the British Army but has now largely been replaced by the Individual Weapon. Note the Trilux night sight. 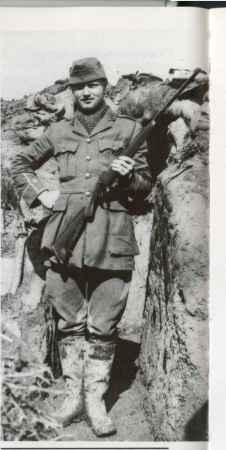 By 1928 the British Government had developed a new service rifle, similar in general appearance and capacity to the Lee-Enfield but a good deal easier to mass-produce. This new rifle, the Number 4, was a most serviceable arm, its main difference from its predecessor being its aperture sight. It was produced from 1941 onwards, mainly in Canada and the United States, although some were made in England. It underwent some modifications, mainly in the substitution of a simple two-range flip back sight for the earlier and more complex one. and some were made with two-groove rifling, but otherwise remained substantially unchanged, the main feature being perhaps the variety of bayonets made to fit it. Selected specimens were fitted with No 32 telescopic sights and detachable cheek-rests and were successfully used as sniper rifles. 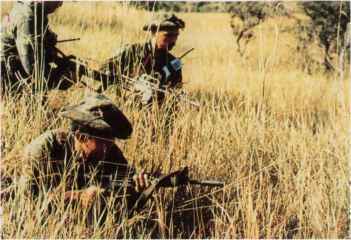 It remained in service in the British regular army until 1957.
and some are still used by cadets It was popular as a target rifle and the current British sniper rifle is based on it Experience in the Far East showed the need for a shorter weapon for jungle fighting and by 1944 a new Number 5 rifle had been developed. It was closely based on the Number 4 but was five inches shorter and 1 6lb lighter Its shorter barrel made a flash hider necessary and reduced its muzzle velocity slightly. It was sighted to 800 yards and fitted with a recoil pad to counteract the extra recoil resulting from its reduced weight. Above: With a Number 4 rifle slung, General Orde Wingate, creator of the Chindit jungle fighters in Burma during World War II, boards a Dakota [C-47] aircraft. The shorter Number 5 rifle was developed at this time for use in the Far East. 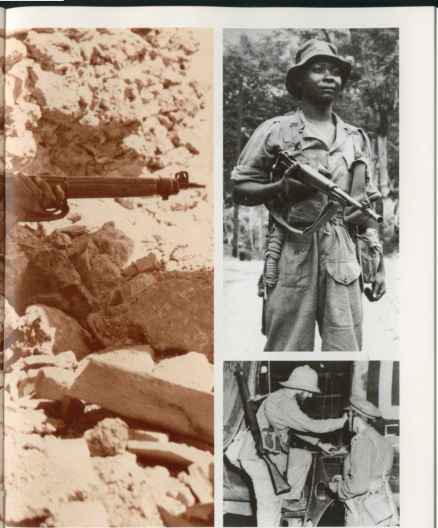 Top: A rifleman of the 1st Nyasaland Battalion, King's African Rifles, uniformed for jungle warfare-complete with rope for crossing swollen streams-and armed with a Number 5 rifle, in 1952.